Harry Royle didn’t simply spring fully formed from my imagination, he is in fact based on a real person. The man behind the fiction, is my late father. He was the classic wronged man, who having made a mistake turned to a life of crime and in the process became a notorious jailbreaker. In 1951 he was Britain’s most wanted man, having escaped from Dartmoor prison and his face made the Front Pages of the national press. In 1954 his story was serialised over a five-week period in The Sunday People newspaper. He was picked up from the gates of Dartmoor by the most famous crime reporter of the time, Duncan Webb. As a son, I knew him as a generous man with a huge heart and a great sense of humour. He had a strict personal moral code and would help anyone he could. He was a great storyteller and had me believing he was a cousin of John Wayne and an adventure who had prospected for gold in the frozen Yukon. Later I would find out that he was man who had experienced his own share of true adventure. Before Harry Royle came into being, the book started out as a nonfiction book about my father. I began researching with another author, Trevor James. Trevor was once himself an employee of Dartmoor prison and had written a number of books about both the prison and the escapes. We were to have co-written the book, but there wasn’t enough background information to fill a book. I am intending to finish this book, with Trevor’s blessing and his permission to include some of his own unique photographs of the prison and surrounding area. I am going write the book to show the real-life behind Royle’s escapes. This will be released as a future title. Harry Royle as a character is not intended to make a hero from a criminal, but to show how different things could have been, if another path had been taken. It is my tribute to the man behind the headlines. A man who as a non commissioned officer in the British army fought in both the North African and Italian campaigns. In the sixties he became a private detective. I have just become a PhonakhEARo, this means that I’ll be part of a community of like-minded people. The Phonak “hEARos” program supports a community of inspirational individuals who harness Phonak’s passion to fighting the stigma attached to hearing loss, tearing down barriers for the hard of hearing and finding new and innovative ways to help everyone reconnect to the beauty of sound. As someone who is both deaf and a Phonak hearing aid user, I’m very pleased to be part of something which is striving to make a very real difference to something which is part of everyday life for so many of us. 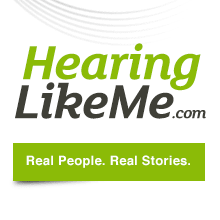 Hearing loss should not be a thing to be ashamed of. Wearing glasses has now become so normal, that in some quarters it’s become a fashion statement. Wearing hearing aids should be no different. I love my hearing aids and wouldn’t want to ever be without them, as they have made such a positive difference to my life. I call the way I write, organic writing, because it grows and evolves as a natural plant does. It needs tending, yes, certainly, but, the process is one of nurturing and helping, facilitating, if you will, but not enforcing or structuring. I don’t plan before writing. That’s correct, I sit down and may have a title or not, but beyond this no real idea of what kind of work I will produce, beyond whether it will be a novel or a short story and the basic genre. I do plan nonfiction, because I think there is a very real need to do so and I blame my journalism tutor, he was a hard task master and things learned, stick. With fiction things are different. I have tried planning and structuring in the past. I took a couple of those creative writing courses back in the 80s when ‘The Plan’ was all the rage. Now, I know many people still love this way of working and I think it’s great, just not for me, it stifles my creativity. Perhaps this way of writing stems from my background. As a stage actor I was used to being called on to use improvisation a great deal and as I morphed into writing, it was with plays, the first of which I workshopped with the actors as it was being written. This gave the written work a natural realistic flow and was often born of trial and error and spur of the moment creative thinking. Once I have started something, I will make rough word sketches of possible places to go, but nothing is ever set in stone. If I walk away from the project, on my return things will have changed and I will then have to work around these new revelations. My characters will often decide to do or say something which changes the whole direction of the story. I never fight this, because if I’m surprised, it makes sense that my reader will be as well. To write in this way, you have to be very confident with your writing and also relaxed about the outcome, regardless of what that might be. For example, my first book, which was to have been written with another author, as a nonfiction title detailing the life, times and exploits of my infamous father, first turned into a novel and then morphed into a trilogy. I use the same organic process when deciding on a book cover. I spend time with different mental images and once I feel that I’m close to something, move onto photographs, choosing how I want things to look. I then mock up my version of the cover (Not pretty) and send this to my cover designer, she then works her magic and give or take the odd tweak here and there, I end up with the cover that I know is right for that particular book. To work the way I do, you have to be very flexible and not too needy. If you need to be in total control of your fiction writing project from start to finish, my way is a highway of nightmares. For me it’s an adventure and I’m never bored with the result, no sooner do I begin something and sit back, the story unfolds and I feel as though I’m along for the ride. The term finding your voice, is heard so often in writing circles, as to make it almost hackneyed in its use as a favourite go to for those wishing to dispense writing advice to the novice author. The only problem with this advice, so often found in the plethora of self helps and how to guides, is that rarely do you find a solid description of just what this fabled and obviously much sought after thing is, the voice. Put in plain English, The Voice, is literally a unique writing style which captures an individual writer’s unique personality. Your voice, once found will be as unique as you are yourself. A mistake new writers all too often make, I know that I did this, is to attempt to capture a specific writing style. It’s not that the writer is trying to copy another, but be like them, as a voice they admire. I was told in no uncertain terms that my writing came across as somewhere between Barbara Cartland and selection of Victorian authors, names, too numerous to mention. I was hurt, offended. How could someone say such things? Well, perhaps, because it was perfectly true. Finding your true voice, is as simple as relaxing when you write and trying to inject a reasonable reflection of the way you speak in conversation, without the umms and arrrs and much repeated phrases. Yes, it’s a lot like film, tv and play dialogue, in that it gets the message across strong and clear, but is better than real-life conversation, because of its clarity. Finding a true voice and it does sometimes take time, not a thing which can be taught. There are no templates or voice engine software available. No, it is a thing which only comes from being yourself as you are writing. Speaking of writing, you do need to be constantly writing, if you want to find your own writer’s voice. You, as a writer, when you have captured a moment of truth, should allow it to simply be. I’m not talking about something huge or earth shattering. No, because this moment could be a perfect description of a pot of tea being made, I am English. Or speaking of beverages, how a cup of coffee arrives at your coffee shop table and how the liquid appears to you in the cup, its colour and behaviour. Truth cannot be manufactured, which is odd, when you consider that I’m talking about creative writing here. Yes, I know it sounds off, but stick with me and I’ll try to explain my viewpoint and it is just that, my view, not a rule or law, just a humble opinion, based on my own personal experience. Capturing truth is a little like when a painter captures a moment. It isn’t an exact duplicate, more of a personal impression and that is why it can have such a deep and meaningful effect on us. We look at the image and feel the reality, sense the humanity beneath, at its core and lend something of ourselves to it. In writing, capturing truth is expressing how you feel about something or someone, without clever editing and smart fancy word-play. It is truth, because it is what it is. During the last six months I have been writing a vast amount, however, the writing concerned has nothing to do with my novels. I have now taken steps to battle my way back to being able to work on my fiction once again. I do enjoy different forms of writing, but my first love has to be creative, as this really is my playground. During my time away the ideas have been coming thick and fast and now the time has come to get them down. I’m also working on my second volume of short stories, Hobbsley’s Secrets. Both books will be out autumn 2017.